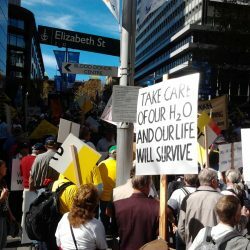 Photos from the May 1st rally, to “Protect our Land and Water” from the ravages of the Coal Seam Gas industry. 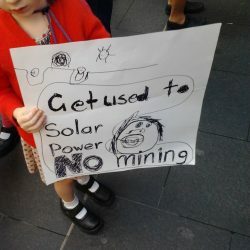 We walked from Martin Place, to Parliament House in Sydney, joining close to 10, 000 people from all over the state, all with their own stories to tell about the effects of CSG on their communities. 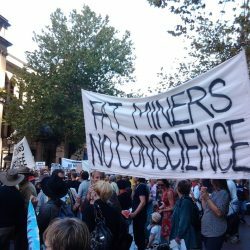 It was galvanising to march with so many people – students, farmers, environmentalists, the CWA – who are traditionally skeptical of each other. We’d found a common enemy: government in the pocket of extractive industries. Hopefully we’re also on the way to forging common values and interests: care for community, environment, food and water. 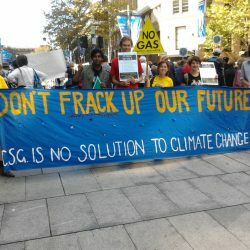 Alongside gains made by environmental campaigns and activists in Australia and worldwide, there has been a rise of opportunistic organizations appropriating the concerns of environmentalism, and taking advantage of public support for environmental projects. This trend is known as ‘greenwashing.’ It is the aim of our collectives, Jews Against the Occupation (Melbourne) and Jews Against the Occupation (Sydney) to bring attention to the way in which greenwashing is being carried out by the Israel-based Jewish National Fund (JNF). The JNF holds official charity, tax-exempt status, and receives fundraising from countries worldwide, including Australia. The JNF promotes itself as an environmental charity, “greening the State of Israel through the creation, improvement and maintenance of forests and the preservation of natural landscapes and open spaces”1. In reality, “its primary goals [are] the development and conservation of land it holds on behalf of the Jewish people.” While the JNF was established as a private organization for the benefit of Jews, it has been given quasi-government status by Israeli legislation. This orientation towards developing land in Israel exclusively for the Jewish people is inherently discriminatory. Israel has often obtained land by violent and extra-legal means. Some of these actions have been condemned as being complicit in war crimes. In fact, many of the “open spaces” that the JNF claims to be preserving are actually the ruins of Palestinian villages, from which residents were forcefully exiled. The JNF then plants forests in these areas, which prevent any chance of Palestinian return. As a charity that touts itself as being committed to the development of the natural landscapes, in actuality the JNF’s practices violate both environmental and social justice standards. A number of Israeli professionals within the environmental sciences have acknowledged the JNF’s work in combating threats such as soil erosion, but have simultaneously condemned the ways in which the JNF is damaging land in the Negev desert and other areas through the planting of non-native species, such as pine trees. Often pine trees are planted in areas exposed to extreme dry heat, in which “the JNF’s trees go up like tinder8” causing devastating forest fires, such as the Carmel wildfires in 2010. Additionally, animals that have developed in the desert landscape have historically lived off only shrubs. When trees have been planted there, birds of prey like shrikes or kestrels have come to the area to destroy local fauna, such as the leopard fringe-fingered lizard, a rare species that lives only in the Be’er Sheva area, and which is devoured by invading species9. Despite attempts at addressing these issues with the JNF, the JNF has not responded adequately. Through its promotion of a Eurocentric, afforested conception of environmentalism, the JNF’s practices have not only contributed to the destruction of indigenous ecosystems, but have also undermined and undervalued the knowledge of Palestine’s indigenous inhabitants. JNF’s actions are relevant to all environmentally-concerned groups in Australia. This comes with the understanding that humans are part of the natural world; that social justice is part of environmental justice. Environmentalists need to recognize that the JNF is not an environmental organization. Its racist ideology contributes to colonial exploitation of the environment of Palestinian people. It aims to secure land for Jews only, with no regard for the lives of non-Jews it may affect. The JNF promotes itself as an environmental organization at global summits and conferences. Environmental groups need to expose the JNF for its unethical practices. ANSTO has claimed that the barrels containing the radioactive waste were not compromised by the crash, and were safely shipped out of Brisbane. However, a doctor who treated two police officers at the scene claims otherwise, and is convinced that they suffered from radiation poisoning. Whatever the story, the risk of accident for trucks carrying radioactive waste on long hauls is not something we should take lightly. A decade ago, the Howard Government calculated a 23% chance that a truck transporting waste between Lucas Heights and the formerly proposed waste dump site at Woomera, SA, would crash each year. The haul to Muckaty will be much longer, and on roads that are notoriously dangerous. Early this morning, road workers on the mid-north coast of NSW were sent to hospital vomiting, after uncovering radioactive material, buried at an unmarked site on the side of the road after a truck crash in 1980. It seems that the State Government was aware that the waste lurked somewhere in the area, but didn’t think twice about sending workers in blind. This event stands as a stark reminder of the dangers that the nuclear chain continues to pose to human health, and the risks that governments and the nuclear industry are willing to take with the lives of workers, communities and our environment. Today’s events also come in the wake of the safe passage of the National Radioactive Waste Management Bill through both houses of Federal Parliament last month, locking in a radioactive waste dump at Muckaty, 120 km north of Tennant Creek in the NT. Waste will be trucked over 3000 km from the Lucas Heights reactor in Sydney, to Muckaty in the NT. 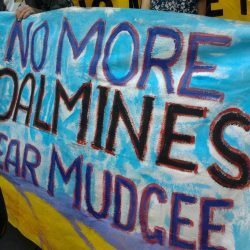 Despite the staggering risks to human health and the environment, and despite the express dissent of Traditional Owners at Muckaty, who are contesting the nomination of their sacred country right now in the Federal Court, the Government is still intent on moving this dangerous waste from voter-dense Southern Sydney, to somewhere a little more out of sight, out of mind. Sound familiar? The Irony is that the transport of this waste puts those living in Sutherland, Liverpool and Campbelltown (the greater Sydney councils through which the probable transport route will pass) at much greater risk than if the waste were simply to stay at Lucas Heights. The Australian Nuclear Science and Technology Organisation (ANSTO) has admitted that there are already 1-2 incidents with transport of radioactive materials to and from the Lucas Heights reactor each year. They have also admitted that they have the capacity to store the waste indefinitely. Clearly, the rationale for moving the waste to Muckaty is political quick fix, and has very little to do with the safe, long term storage of waste. More than 30 years on, the result of one truck crash is still echoing forward, a threat to unsuspecting and unprepared workers. The waste marked for transport to Muckaty will remain radioactive for much longer. Traditional Owners at Muckaty have been running a strong campaign against the waste dump for almost 7 years now, since the site was first nominated. Organisations and activists around the country have joined the fight, and now it’s time to stand up as a movement with the communities and workers at risk all along the transport route.